Friendly north-side barbecue joint where the owners know their stuff. The five fellas behind Smoque are savvy businessmen. They chose a name—clever or annoying, you decide—that got people yapping months before they opened. And they talk a good game too. 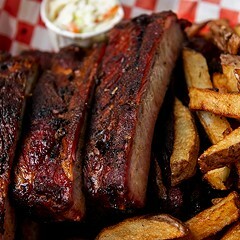 Their lofty "BBQ Manifesto" (available at smoquebbq.com) displays a respect for tradition and authenticity, and it ought to be required reading for anyone who thinks barbecue is easy to make or that "fall-off-the-bone" Chicago-style ribs are acceptable. In spite of it, I was suspicious, but with a few caveats I'm happy to say the place is a welcome addition to the woefully barbecue-bereft north side. The house-made sides are good: the mac 'n' cheese has a nice tang, and the noodles in it stand up to the teeth. The slaw is thickly cut, crunchy, and lightly dressed; the beans are mingled with chunks of onion that a real human had to have cut; and the two different barbecue sauces play their proper role as accessory, not focus. 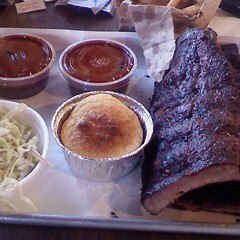 I won't order the ribs again—overrubbed and briny, they have nothing on Honey 1's. But for a juicy, smoky chicken or decent pulled pork, amalgamated with crispy and fatty bits, you could do a lot worse. And what I'll definitely be back for is the brisket. It isn't the transcendent smoked-beef experience that's so easy to come by in Texas hill country, but as far as I can tell no commercial establishment in the region comes closer. 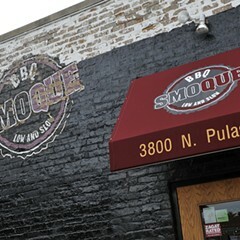 Smoque goes a long way toward endearing itself to customers with a staff that's attentive, knowledgeable, and eager to please. 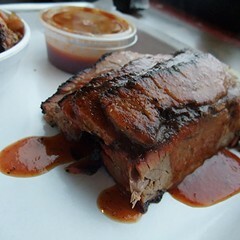 Order that brisket fatty and watch what happens. Two new barbecue joints shore up south-side barbecue supremacy.